The Rough Art to Cover Ghoul is unique in many ways. Besides being the only rough found from the 1967 DieCut Series, it is also the oldest wacky pack item known to exist. Dated January 1967, Cover Ghoul was obviously drawn on a drafting table, probably within the Topps art studio. Other known roughs (3rd - 16th series) were done more quickly and casually. Usually the artists were freelance and worked from home. These later roughs ranged in size from normal 8x11's to a mere 3" in size. Sometimes the artist would have an idea while out with friends and turn in a sketch on a napkin. 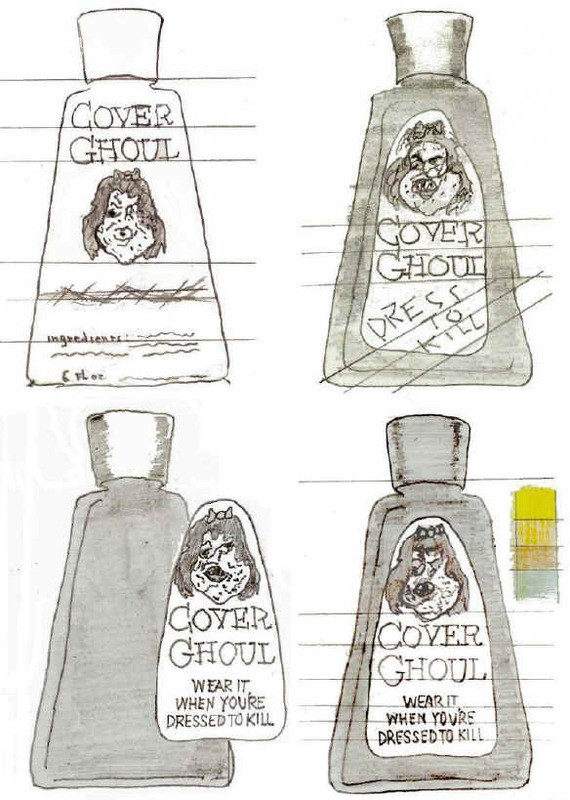 With four concept drawings, showing the progression of the artist's work, Cover Ghoul is the only original series title found with more than one sketch. And at a whopping 17"x 22", the ghoul rings in as the largest wacky art piece.